NOTICE: Activation key must be used on a valid Steam account. Requires an internet connection. About the game	Build your team of Squid heroes for epic turn-based battles against corrupted crabs and shrimps!Steev and the rest of the Squids are in danger! 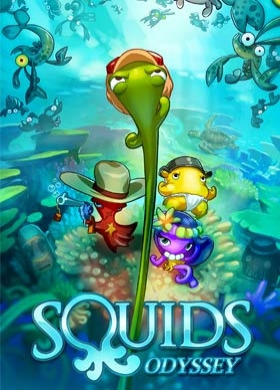 An infectious ooze is corrupting their world, and this band of unlikely heroes needs to fight back to save their kingdom.Squids Odyssey is not ju… st about gorgeous cartoon art, jaunty music and humorous storytelling: the battles provide a deep challenge as strategy and skill are required to use the environment and the Squids' strengths to lead your team to victory! 3 million players loved it!No Squids were harmed during the making of this game. Key features Build your party from 15 different Squids in 4 classes: shooters, scouts, troopers, and healers. Win turn-based battles with strategy and skill, using the environment and your party’s strengths to your advantage Engage in 90+ missions for more than 15 hours of gameplay, plus an expert Pro Mode that doubles the game length and provides extra challenge. Boost your heroes abilities with 65+ barmy helmets. Battle your way through Greek citadels, tropical coral reefs, old West inspired towns and Japanese temples to save your underwater world! system requirements Windows - Minimum OS: Windows 7 or more Processor: Intel i3 (2.4Ghz), AMD Athlon 64 (2.6Ghz) or equivalent Memory: 1 GB RAM Graphics: Radeon HD 7450, GeForce GTX 550 Ti or equivalent Storage: 800 MB available space Additional Notes: Might work with a lower configuration!© The Game Bakers 2018 - All rights reserved.